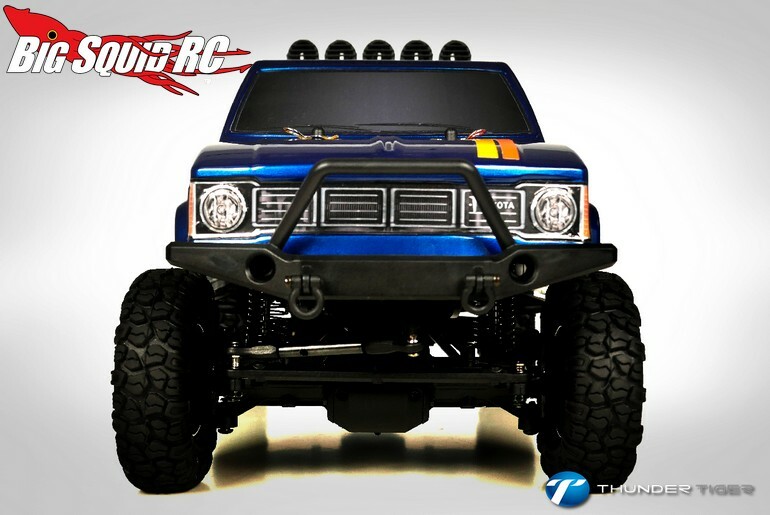 Everybody’s Scalin’ – A Run Around the News « Big Squid RC – RC Car and Truck News, Reviews, Videos, and More! It’s been awhile since I’ve done a general “what’s new in scaling” type-post, and I figure we are overdue. First up is the Thunder Tiger Toyota Hilux. The other day TT posted a pretty sweet video of the truck in action. Gotta say, it looks pretty capable. We are hoping to get one of these for review soon, so you can look forward to lots of our own video. Speaking of reviews, some have asked where our review of the HPI FJ is. We had it on good authority we’d be getting ours early summer but there has been radio silence since mid-May. We are still hoping to have one just as soon as they start showing up in the US. Some of you may of noticed that over the last few weeks many retailers are starting to get Axial product back in stock. This is a very good thing. With Axial’s supply issues seemingly in the rear view mirror, I’m stoked to see what they will do next. This is the longest period since becoming one of the hobby “big boys” that the company has gone without a new release, the last being their Yeti Jr. series of vehicles in December 2016. Going back to just announced vehicles, Carisma has been teasing a scaler. A few years back they released a killer Porsche 959, so it’s exciting to know they are going to do a crawler. One would expect a great looking hard body, as the 959 had about as good a shell as you’ll ever see on a RTR. Pit Bull is back at it and releasing another new 1.9 tire, this time the Braven Ironside. It’s siped-lug city! My scaling tire allegiance has shifted throughout the years, but it started with Pit Bulls back when the OG Rock Beasts came out. I haven’t run a set since the Mad Beasts, but hopefully I nab a set of these to try out on our TRX4. I’ve been wanting to try out their Alien Kompound, as I know many rave about it. Traction Hobby announced a gigantic 1/8 “Cragman Scale Crawler“, based on a JK Jeep. I’m not familiar with this company, but the renderings have a good chassis layout. I’m all for large scale crawling so I hope it winds up being a good runner when it hits the mainland. Speaking of new(ish) vehicles, I have been meaning to talk briefly about the AE Nomad desert buggy. They remind me very much of the classic Axial Exo-Terra Buggy. I’m not sure what kind of market there is left for a non-solid axle caged buggy, but hopefully AE has no problem moving them. It’s always nice to see a racing company try and do something in another genre. I’ll end with RC4WD. As per usual they’ve been cranking out cool accessories. I particularly like the 1.9 Goodyear Wrangler MT/R’s they’ve come out with. For the longest time they’ve had the unlicensed-but-inspired-by MTR “Two-Face” tire, but it’s great to see an official version come out. That’s always been one of my favorite looking full scale tires. Whew, sorry for the wall of text. That about catches me up. Next week, barring major news, I have a tech article in place for you all, one that many have requested. Until then, have a good one!